In this first week of the new year, many of us are still tossing around the idea of setting traditional New Year’s resolutions. We say we’ll exercise more, eat healthier and get more sleep. We start out strong–and fail by Friday. Ouch. And then there’s work. We set extreme resolutions like “change careers” or “make more money.” Sure, those aren’t bad concepts in themselves, but it’s my experience that aiming for such targets is like shooting a pigeon with a cannon–overdone, and you’re still likely to miss. What I’ve found working with my clients is that the things that aren’t working for us at work don’t take dramatic, 180 degree actions to repair. There are small, simple actions we can take to improve our worklife and find more success in ways that are important to us. So here’s my list of 23 small-but-powerful resolutions you can make to change your life at work. Try one or two (not all!! ), or share your own with us by email or on our Facebook page. I’ll build my support team. I don’t have to do it all. I’ll click less to connect more. I’ll stop feeling bad about having emotional reactions to events at work and instead, start paying attention to my emotions so they put me in motion. I will not hold back my opinions, no matter who may feel otherwise. I will get to know ______ [name], someone I know I need to know. I will deepen my relationship with ________[name]. I’ll schedule ___[number] lunches, coffees, or other meetings with people not connected to my company. I’ll attend ___[number] professional event(s) to meet new people in my field and keep broadening my perspective. I’ll focus on being more interested than interesting. I will choose not to let _______[person’s name] continue to annoy me. I’ll just replace my frustration with empathy and walk away. I’ll sign my own permission slip and do something just for me on a regular basis, without feeling guilty or stressed about it. I’ll get crazy curious and ask bigger questions of my boss and my colleagues. I’ll practice bragging on myself regularly. I’ll look ahead in my career and take control now to get ready for my next act. I’ll get clear on where I’m stuck, and take control to get unstuck. I’ll create my own Brag List before my annual review (or really, anytime in the year). I’ll experiment with new tools like these to support my ongoing success. I’ll focus more on believing that it matters. I’ll find ways to love the work I’m with, as long as I’m with it. I’ll continue to be/become the person people want to work with (and the person I’d want to work with). 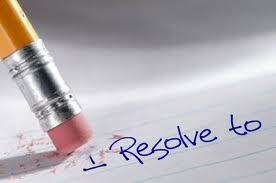 What are your worklife resolutions? Share them with us by email, by replying to this post below, or on our Facebook page. Like this article? Get new posts directly in your inbox by subscribing to our twice-monthly Community News here. And watch for my book, Bring Your Superpowers to Work: Your Guide to More Clarity, Confidence & Control, coming soon!